International Cricket Council (ICC) agreed the request of The Board Of Control For Cricket In India (BCCI) to change the cricket bat size of Master Blaster Sachin Tendulkar. The bat will have 1.5x to 2x more than his current bat and with half the weight. "We sent a special request to ICC after Sachin finished his beautifully constructed and technically right inning against England yesterday," said N Srinivasan, Chairman of BCCI. He said "In a genuine request we asked them to consider flawless record of Sachin for last 22 years and his unblemished great contribution to India politics. We also acknowledge them a fact that he was the only player playing for Indian cricket side with Member of Parliament's batch." Srinivasan confirmed that the development was nothing to do with recent flip flops of Sachin Tendulkar in cricket and told that he felt it would be tribute giving a giant bat to a giant of the cricket. "BCCI always think of entertaining Indian cricket audience. 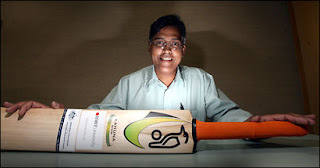 This way we thought that if Sachin gets 2 times a larger bat he would convert 17 runs into 170 runs," said N Srinivasan. 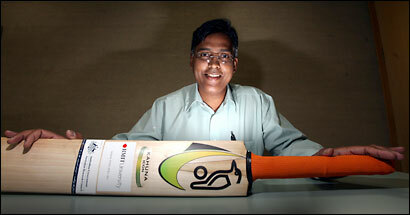 BCCI also confirmed that ICC agreed to its request and now negotiations are going on the size of the bat. "ICC thinks that 1.5x larger bat is sufficient for Tendulkar as he is having great cricketing technique and sense while BCCI said that it is only interested in the longevity of the Cricket audience seating and watching his inning," said a top official of BCCI, requesting anonymity.